New to the market with our first stay just being over at the beginning of June! 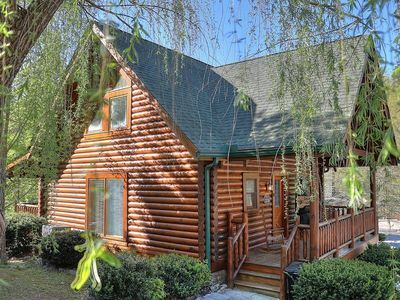 Looking for a cabin that is not in a crowded community? 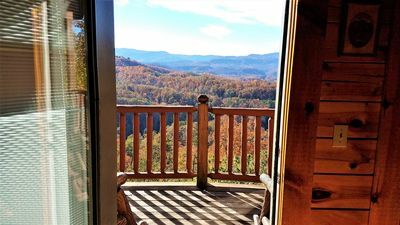 This cabin offers a great view and PRIVACY while being very close to Pigeon Forge, Dollywood, and Gatlinburg! 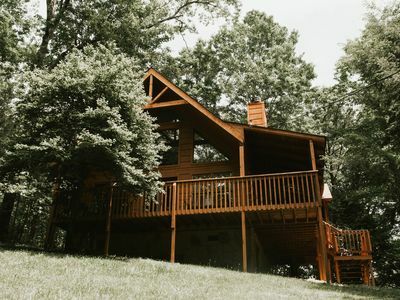 Offering everything you could imagine in a mountain getaway, this cabin features 2 king beds, 3 queen beds, and 2 queen over queen bunk beds, with a queen pull-out sofa and full size futon can sleep 22. All beds (with the exception of bunk beds) have pillow-top mattresses! 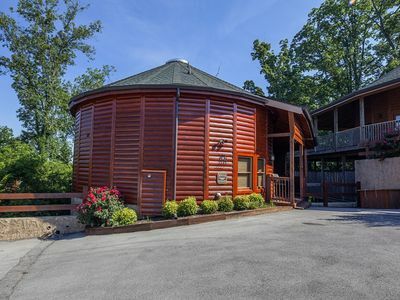 The property also has 4.5 baths. This property was a private residence until this year and has many upgrades including a large kitchen with granite counters and stainless steel appliances, a newly renovated master bathroom with a walk-in shower, Jacuzzi tub, and porcelain tile floors, 2 newly renovated bathrooms on the lower level along with 2 huge bedrooms. 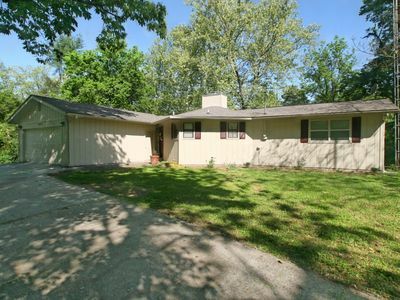 This property is completely free of carpet to minimize issue with allergies. We are offering a 10% discount for a 7 day stay! 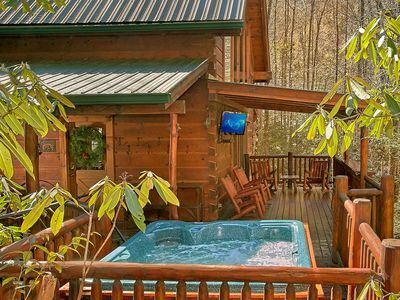 We have just added a hot tub that is on the deck just outside of the master bedroom. Additional pictures will also be added as we plan to include a fire pit for your enjoyment. The main level of the house also includes a huge master bedroom with a king size bed and a sitting area with a loveseat. The master bath has a tiled walk-in shower and a new Jacuzzi tub. The lower level of the house also offers parking for several vehicles and requires no stairs to enter from outside! This level has two huge bedrooms. One bedroom has 2 queen beds and also has a table and 4 chairs. The other bedroom has it's own private bath and a set of two queen-over-queen bunk beds allowing 8 people to sleep comfortably. The room includes a 50” HDTV and PS3 game system. 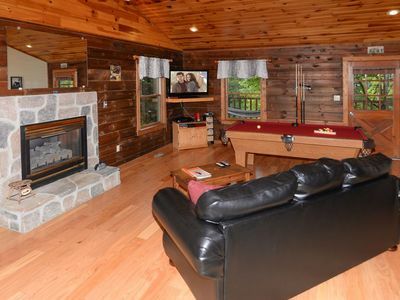 In between the two lower level bedrooms is a large game / movie room that is equipped with a 65” TV for watching movies. The game room also includes a foosball table. There is also another full bathroom that has been recently renovated. Just outside, there are another two picnic tables if you would like to spend some quite time outside. 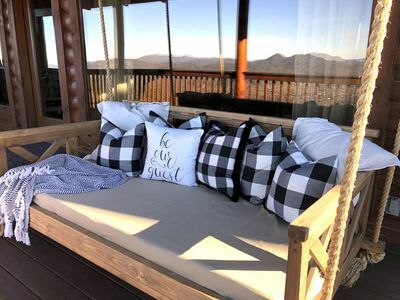 From the main level of the property, head up the stairs to an open loft that includes a full size futon that can serve as a couch or a bed and an air hockey table. The loft offers a full view of the open main-level living room and also great views outside! From the loft, there are two bedrooms and another full bathroom. 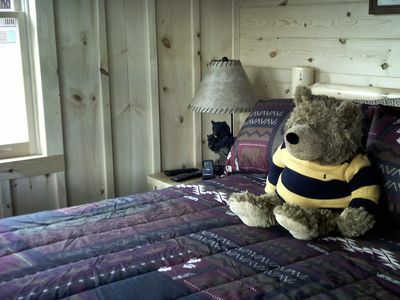 One bedroom offers another king bed along with a small sitting area and full size dresser. The other bedroom, offers a queen size bed and a small sitting area. 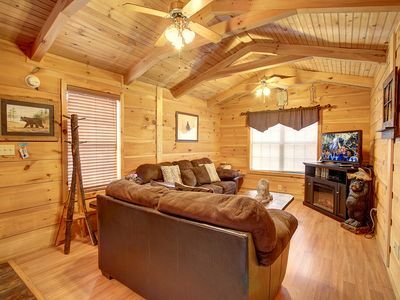 Both bedrooms are equipped with ceiling fans if you enjoy a breeze while you sleep. 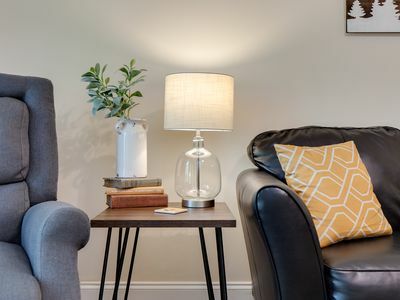 The property is equipped with high-speed (100 MBPS) Wi-Fi! Comcast TV is also provided along with access to NetFlix for movies. 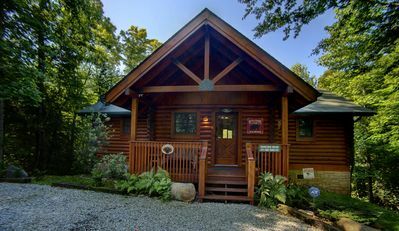 This is a great cabin for multi-generation families. It has ample parking for 6 cars, and is easily accessible with good roads that aren't too steep. 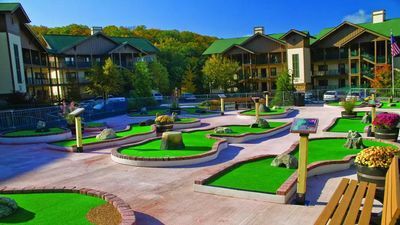 You are close to the attractions with a nice mountain view, but you don't have to fight traffic to get there. Please note, our cleaning crew will set out towels and plates for the number of guests that are registered for the stay up to a total of 22. 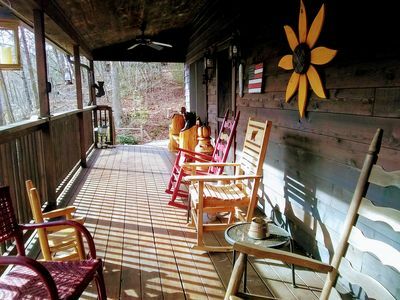 We are located in an uncrowded neighborhood on an acre of wooded land. It has the mountain view with a feeling of privacy and space. We are between 2 to 8 miles to almost every attraction. 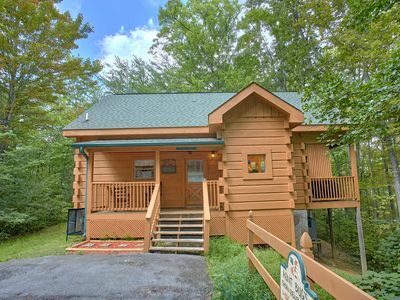 The property is located 4 miles off the parkway and the roads to the parkway are easy to travel. 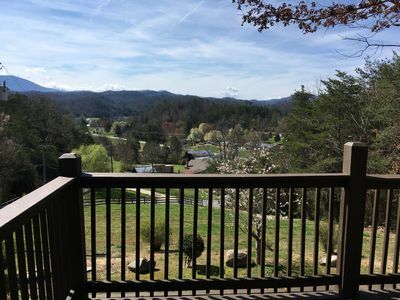 VRBO does not allow links to the websites, but you can do a quick search for attractions near Pigeon Forge and there is a great website that gives a lot of info. You can also look up the Pigeon Forge Community Center for additional info. The Great Smoky Mountain National Park is the backyard of our cabin. 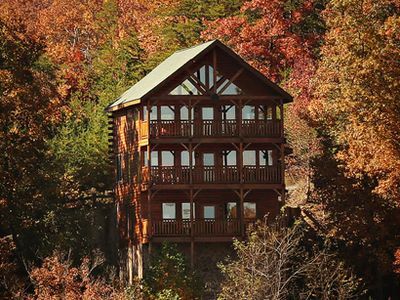 “His Amazing Grace” provides the perfect venue for all your pondering. 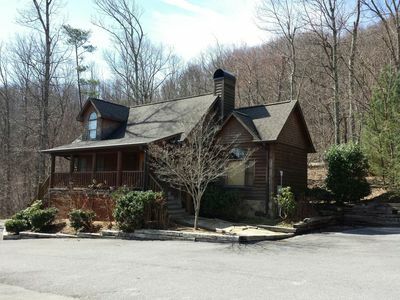 Private 1 bedroom Smoky Mountain Cabin located in Beautiful Wears Valley! 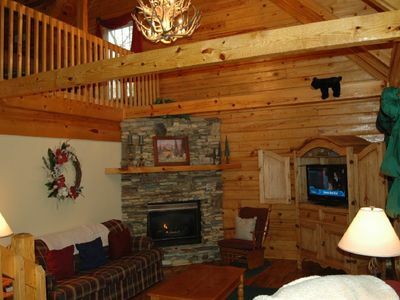 BEARS VALLEY is a custom built log cabin located in the foothills of the Great Smoky Mountains. 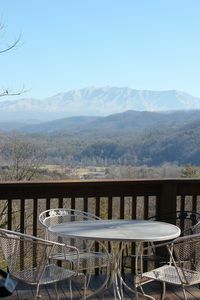 Enhance Your Vacation At Great Smokies! 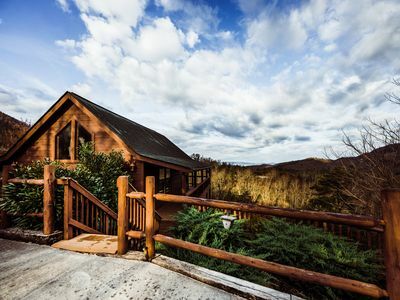 "Breathless" High Mountain Top Cabin with Great Smoky Mountain Views for miles.